In a stunning announcement that dropped December 16, Jim Savas, VP/GM of automotive at media conglomerate UBM Advanstar, announced the immediate end of Dealernews as of December 23, 2015. 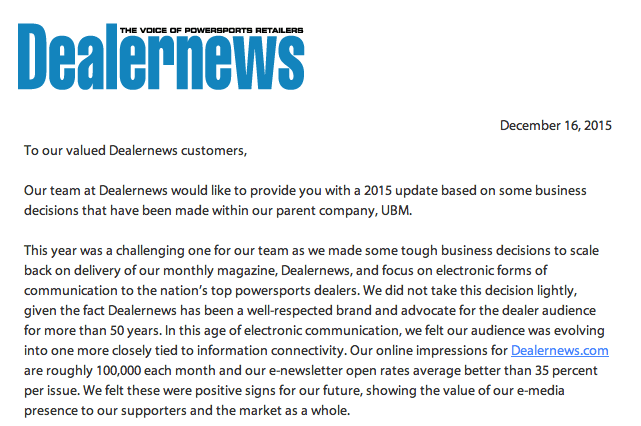 After initially making the case for a robust online presence, well supported by more than respectable metrics, Mr. Savas then set January 1, 2016, as the cessation of Dealernews in print, on the web, and across all digital channels. This entry was posted in brand management, powersports and tagged aftermarket, media, powersports, publishing on December 18, 2015 by John Siebenthaler. When it com es to promoting a business, nothing is more critical than the brand logotype. Getting it right goes a long, long way towards making an impression on a distracted public that sees thousands of visuals on a daily basis. To be successful, a corporate mark requires design integrity, repetition in the marketplace, and a connection to the goods or services it represents. Whether abstract or literal, the Nikes, Apples, and Coca-Colas of the business world rely on a recognizable visual that connotes quality and trust. Looking at the before and after (above left) of IHOP’s haircut and a shave, it’s difficult to imagine how the approval process resulted in what struck one reviewer as a “sinister” smile beneath the word mark. It’s arguably more legible, but only slightly, and that’s about where it starts and ends. The IHOP acronym, in case some may have forgotten, stands for International House of Pancakes. But that’s not what I see when I try to decipher the new and improved visual. Emoticon, meet emoji. HOW Design recently interviewed Siegel+Gale, a New York based branding agency known for their standout work, on the recent spate of chain restaurant logo overhauls. For anyone who follows corporate design, the candid remarks by the agency’s designers are for the most part an indictment of the perils of lackluster graphics. A couple of things stand out in this collection of shareholder dependent corporate eateries. First, it’s more than okay to overhaul the corporate brand on an as needed basis. Nothing says stay away like an aged, dated, and most importantly irrelevant logotype. Second, once having decided on a freshening, make sure you’re just not slipping sideways. Design updates should – probably – include references to historical looks that over time successfully represented a company to its public. But don’t let fear of letting go put up unnecessary barriers to a truly fresh, inspired interpretation that acknowledges the past while extending the future. Bon appétit! This entry was posted in brand management, marketing and promotion and tagged branding, graphic design, logotype, marketing on September 17, 2015 by John Siebenthaler. Florida’s Pinellas County is the most densely populated county in the state. It’s also the smallest, but that has never affected its ability to draw tourists from around the globe, intent on visiting world-class beaches from Caladisi Island State Park on the northern end to Fort Desoto County Park guarding the entrance to Tampa Bay. With gas prices at their lowest level in years, an economy that’s on the rebound for the first time in years, and a brutal winter that continues to lash the northeast, convincing northerners to turn their wanderlust into momentum and head south isn’t a heavy lift. Nonetheless, Pinellas County’s marketing arm, Visit St. Pete-Clearwater, came up with a rock solid bit of creative when they launched a campaign centered around a family of nomadic snowmen who began showing up in slush and dirty snow blanketed New York and Chicago. 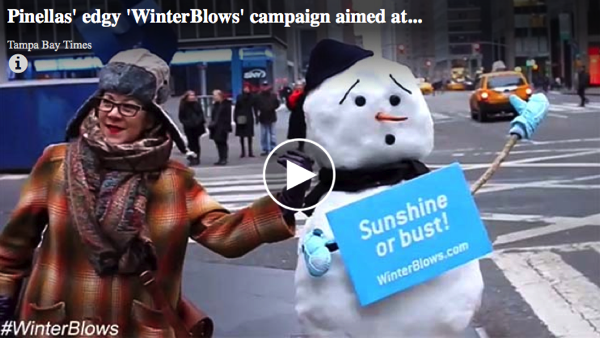 The edgy “WinterBlows” campaign plants irresistible (and guaranteed to have lines forming for selfies) faux snowmen on the sidewalks displaying sandwich boards headlined “Sunshine or bust!” and the WinterBlows.com URL. Is it working? I’d have to say yes, considering how congested the main two-lane north-south beach artery, Gulf Boulevard, has become in recent days. There’s nothing that can match a smart, well executed, marketing solution. This entry was posted in brand management, marketing and promotion and tagged advertising, marketing, social media on February 16, 2015 by John Siebenthaler. 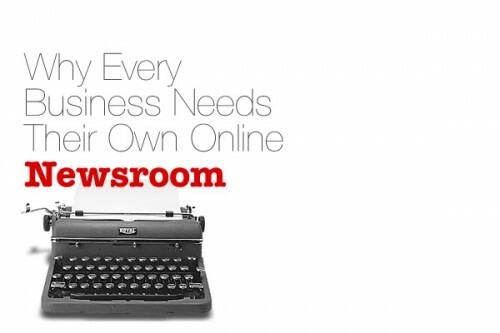 Small businesses can benefit from creating a unique online newsroom. As whats left of print media transitions into a hybrid that blends traditional content with digital distribution, private industry is likewise developing answers for inventing new channels of promotion and publicity. Read about how Coca-Cola is a leader in setting up and stocking unique content for both consumer and b2b consumption. The need for effective strategies is best seen in the use of Search Engine Optimization (SEO) and Search Engine Marketing (SEM) as essential marketing disciplines. Both focus on the power of search to direct audiences inbound to content, and those same procedures are being successfully refined and funneled in the establishment of online newsrooms. Online newsrooms are a physical location unrelated to Google News’ rich snippet metatag aimed at specific categories and reserved for branded publications. Yet the preparation of materials for the online newsroom should include some of the same workflow that’s utilized in a Google News approach to pull marketing. Online newsrooms are also a total departure from the commonly used and outdated drop down menu method of accessing company news and resources, which requires multiple steps before even reaching a starting point and focuses solely on archiving content, not repurposing. The contemporary onliine newsroom is designed as a visual destination separate from the main website. It’s a unique container offering an assortment of video, audio, text, visuals, and ready-to-wear social content – all delivered in an easy to use User Experience (UX) layout that puts a premium on interesting and engaging presentation to serve various forms of content that might otherwise go unnoticed. Today’s news resource – and that includes all that PR brings to the mix – must deliver solid content quickly and easily to a wide audience with unique needs. Design, creative, IT, and marketing all have a part to play in the successful implentation of a modern online newsroom. Design your online newsroom to make maximum use of visual breadcrumbs and cues to guide editors, researchers, writers, and curators in finding not just what they’re looking for, but what they need to accurately inform their audience about XYZ Company. Need help? Lets explore a solution custom tailered to fit your needs. This entry was posted in brand management, digital media, public relations and tagged pr, public relations, publicity, web design on June 9, 2014 by John Siebenthaler. Mismanaged content meant the wrong kind of reach for this dealership. A six-month social media marketing consultation for a multi-line powersports dealership that reps several metric makes, a domestic brand, and PWC and OHV inventory was the inspiration for this post. Located in a large Southeastern market, a neglected social media program wasn’t producing the growth one might expect given their footprint. Management depended on traditional automotive push marketing techniques based largely on motivational training and consisting largely of clichéd slogans and a steady diet of overwrought memes. Making matters worse was content posted by employees, one in particular, who didn’t understand that the approach required for a business page had nothing to do with their personal life online. When I got involved the CMS vendor hired for site design and management had set up an incomplete Google+ page and a lamentable blog that immediately failed. These “assets” joined a struggling Facebook timeline and an abandoned Twitter feed that, together with a local weekly bike night, made up a dysfunctional marketing strategy that defied the concept of content coordination. The social goal was easily defined: increase organic growth, reach, and engagement using proven social media business techniques. In the end it was a waste of their money and my time. Based on my direct experience with this dealer, I emerged with a Five-Step Program for improving your social media marketing assets. Here are my Top Five Social Marketing Essentials: the minimum elements a social media marketing program needs in order to have any chance of success. This ad for snowmobiles in Florida stayed up for months. When management is “too busy” to monitor their own content, they deserve the worst result from a dysfunctional effort. Would you expect to see snowmobiles sold in Florida? In July? 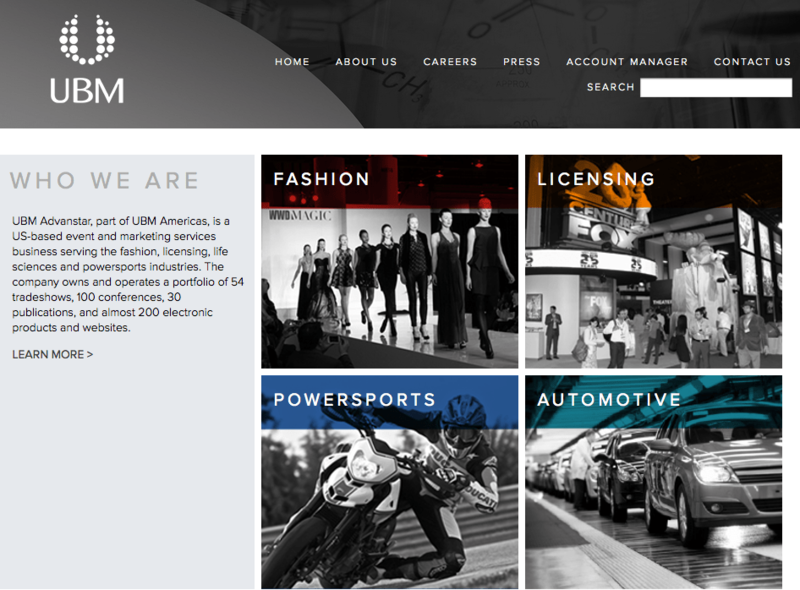 This embarrassing post by the client’s CMS vendor and web site IT, a well known powersports service provider, stayed up for weeks because management refused to look at their own channels. I won’t comment on the use of transparent background PNGs against a lime green <IMG> tag background color. Lesson? Stay engaged or risk the consequences. Social didn’t have a seat at the table when sales, promos, or events were planned by the sales manager. OEM marketing opportunities came and went without generating earned publicity. Result: a failure to connect using basic tools like page event apps to promote engagement and activity. Further muddying the waters — multiple managers had independent control of multiple channels. Result? A total lack of content direction and coordination. Lesson? Assign one manager as point-of-contact, with authority for all content and the option to grant multiple contributors access to team functions. Personal friends list used by greeter to prop up skewed reach. Stats can inform or mislead. When they’re manipulated, the result can be deceptive and misleading. Despite a favorable (chart at top) 68% male-31% female fan mix, the reach skewed heavily towards women, not men. This disconnect is traceable to flawed post content by the lobby greeter’s attempt to pad metrics by polling her personal Facebook male friends for likes. This shifted the ratio alright, but only by creating a false positive that distorts the desired organic results and won’t fool Facebook. Lesson? Manipulated stats disguise reality, lead to bad decisions based on false facts. 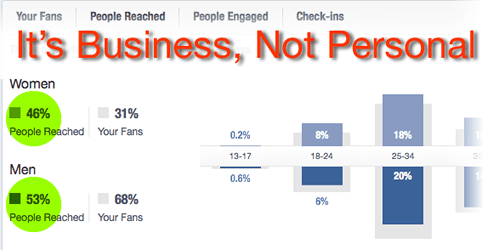 Social marketing is about pull, not push. Understanding the general strengths and weaknesses is essential. It’s a unique medium that requires regular care and feeding in the form of professional attention. Audience engagement can’t be forced; only quality content of interest will attract interaction. Google knows this, and you should also. Lesson? Quality content continues to be the prime ingredient in a successful social campaign. The number one requirement for a successful social marketing program? Speak professionally, using one knowledgeable voice. The dealership’s in-house voice, a former barista turned lobby greeter with zero motorcycle knowledge and a dysfunctional writing “style”, was allowed to post disconnected content online, without review, like the incoherent example below. Off-roading enthusiasts love the adventures and the risks and adrenaline associated with it. Speaking with the novice portion of this crowd, one of the most commonly inquiries is, “Do you know where I can ride these?” It’s a very just question. Now a great place to cross off your bucket list is the Apalachicola National Forest. Located in the panhandle, there is 195,000 acres worth of lush, loamy nature. They conveniently have about 80% of their trails marked very well. However, it is also rumored to have many undiscovered trails with very little traffic. Yeah it’s a bit of a trip, but do ya really plan on staying at home for the rest of your life? I rest my case. Lesson? Social programs too often see Nike’s success selling shoes as an easily copied meme. Reality? Without professional creative talent efforts aren’t just wasted, they’re counterproductive. Don’t be this dealer. Commit to using the prestigious power of social media. Make it count. Engage your qualified market. This entry was posted in brand management, marketing and promotion, powersports, public relations and tagged content, facebook, internet marketing, powersports, social media on January 2, 2014 by John Siebenthaler. Reporter Dexter Ford writes in the paper’s Automotive section about the challenges facing the nascent industry, not least of which is cost. Far cheaper conventional alternatives, eco-friendly and offering the same or better mileage per comperable fillup, are getting top billing as the major Asian motorcycle brands begin to flex their muscles in taking on not only high-end electrics but cheap, disposable Chinese scooters as well. Compounding the confusion over electric’s future is a same-day post on the NYT’s Wheels blog on Zero’s 2013 lineup just introduced at Intermöt. In what’s seen as a responsive reaction to marketplace concern, the Santa Cruz, CA, company is moving away from the mountain bike inspired initial design towards a more familiar traditional look courtesy of former Buell designer and now Zero’s chief technology officer Abe Askenazi. 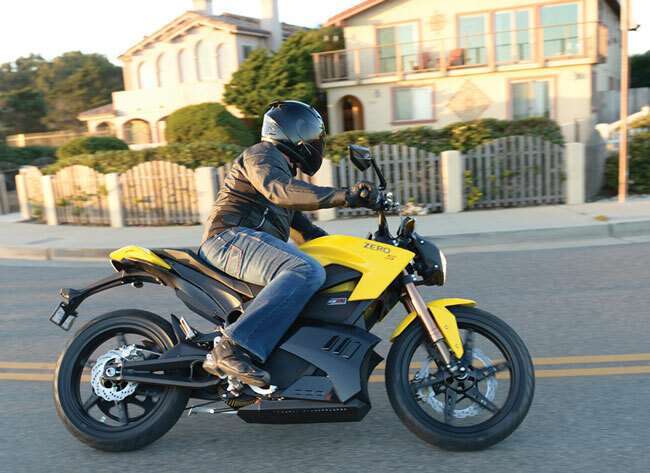 Between the high performance Lightning, the gyro stablized LIT Motors C1, or the mainstream (for electrics) bikes from Zero and Brammo, interest isn’t going away. And neither is the significant cost differential, or the lingering comparisons to Segway’s marketing rationale. Whether that same interest will translate into sustainable sales for complete bikes or morph into a niche industry of DIY builds sourced from frame makers, engine manufacturers, and battery suppliers might be the unanswered question. This entry was posted in brand management, marketing and promotion, marketplace news, web and tech and tagged brammo, electric motorcycle, mercedes, zero on October 15, 2012 by John Siebenthaler. Logos, logotypes, and trademarks have become integral to everyday life, from the pictograms used to order your lunch at Mickey Ds to finding your way to the next road trip gas stop. This six-minute primer from the PBS Off Book series looks in on the history, tradition, and uses of a visual identity and establishes the argument for professional design versus the DIY approach that’s emerged as a result of desktop publishing empowerment. Properly done, visual identities are a powerful marketing tool that work to fulfill an observers expectations. When that design is poorly developed, communication suffers. This entry was posted in brand management, graphic design and tagged advertising, design, marketing on July 17, 2012 by John Siebenthaler. 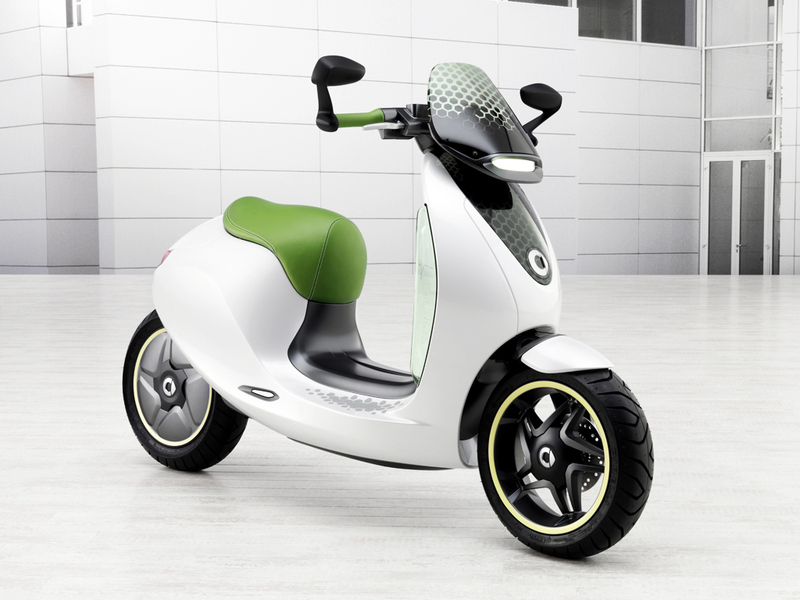 I take last week’s news of Daimler’s entry into the green scooter market come 2014 as more of a solidification of their alt transport low-zero emissions SMART brand than any sudden two-wheeled epiphany. Miniscule financial risk, max pr value, and a lot of genuine utilitarian functionality backed by diamond plated quality control, first class marketing, global distribution, and built-in market affinity even though Smart car sales haven’t exactly soared as first envisioned. The news accompanied the announcement by Reuters of this summer’s Smart ForTwo four-wheeled ev launch. How tough will it be to convince yacht sailing, pied-á-terre dwelling, polo pony riding ‘Benz owners to swipe their debit card and pick one up – I see a discreet POS gift card offering by the cashier’s window – on the way out of the dealership? Answer: not too. You’ll look in vain, by the bye, for these same folks at a local indie scooter store. Not everyone’s convinced. This Automotive News critique after the initial 2010 announcement pans not just M-B, but the entire scooter riding universe. Oh well. For Daimler it’s almost all about reputation: expecting however many scooter sales to add significantly to the bottom line is hallucinatory. Much easier to boost profits selling Dyson cordless vacs as P&A. A rolling ev test bed, on the other hand, is not, and that’s scaleable. For in-depth analysis of M-B’s 2-wheeled move, Martin Racing Performance’s blog goes on at length and in great detail on Daimler’s decision, with insider perspective on what it means for the nascent EV scooter/mc channel overall. Magic 8 Ball: if this does work out, might the technology be licensed to existing badges? One might well imagine. This entry was posted in brand management, marketplace news, powersports and tagged emissions, ev, marketing, motorcycle, scooter on May 12, 2012 by John Siebenthaler.